Older e-bulletins can be found at IFJ Asia Pacific website. The International Federation of Journalists (IFJ) is the world’s largest organisation of journalists. First established as the Fédération Internationale des Journalistes (FIJ) in 1926 in Paris, it was relaunched as the International Organization of Journalists (IOJ) in 1946 but lost its Western members to the Cold War and re-emerged in its present form in 1952 in Brussels. Today the Federation represents around 600,000 members in 140 countries. 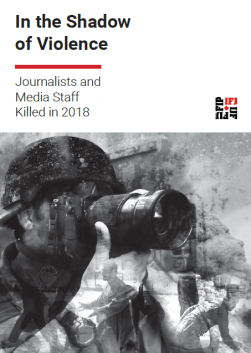 The IFJ promotes international action to defend press freedom and social justice through strong, free and independent trade unions of journalists. The IFJ does not subscribe to any given political viewpoint, but promotes human rights, democracy and pluralism. The IFJ is opposed to discrimination of all kinds and condemns the use of media as propaganda or to promote intolerance and conflict. The IFJ believes in freedom of political and cultural expression and defends trade union and other basic human rights. The IFJ is the organisation that speaks for journalists within the United Nations system and within the international trade union movement. IFJ policy is decided by the Congress which meets every three years and work is carried out by the Secretariat based in Brussels under the direction of an elected Executive Committee. The last Congress was held in Angers from 7 to 10 June 2016. 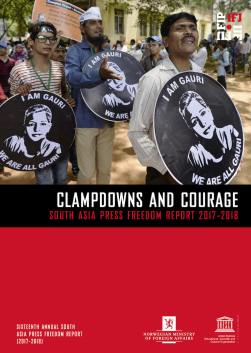 Media in South Asia has grown without journalists having a clear perception of best practices for the public right to free speech and information. 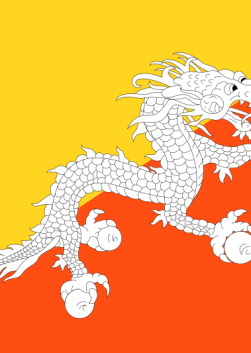 Legal and institutional constraints remain, despite commitment in most national constitutions to these basic rights. The current climate of impunity, which allows attacks, including the killing of journalists, to go unpunished has a chilling effect on free speech and challenges campaigns in defence of press freedom. The South Asia Media Freedom for Democracy project seeks to bolster the capacity of South Asian journalist organisations and press freedom groups through the South Asia Media Solidarity Network (SAMSN), an alliance of journalists’ trade unions, press freedom organisations and activists in South Asia committed to working together to promote freedom of expression and journalists’ rights in South Asia. The project conducts training workshops; rights monitoring, advocacy and digital campaign skills development; will create a Digital Hub of resources and campaign guides, including on Freedom of Expression in the digital space, action alerts, distribute monthly and half-yearly bulletins; conduct collaborative missions and campaigns; and produce an annual report providing a progress report of where the campaign is at and what more needs to be done.